Like all good fairy tales, this one begins at a particular point in history (upon a time) and, as far as things go, happened in singular fashion (once). Thus, like all historical events that have already transpired, we may say that it happened, Once Upon a Time. Once upon a time, in the kingdom of Larger Ubridia, there was a princess called Aesileif. This was a Germanic kingdom, and in those days, the name Aesileif was considered a very charming name for a young woman. I have some knowledge of languages and history, and I assure you this is the case, and you really should be more trusting of your narrator. This is not what you might call a “post-modern” fairy tale in the sense that you have an unreliable narrator. I assure you, I am quite reliable, and this is entirely historical. Aesileif was the kind of princess who dutifully did her work. She sat at the distaff all day as musicians played on the lute or some other obscure instrument that a modern person would say “that looks like a guitar” of. At times songs would be sung of the great heroes who had ridden into battle in the olden days, like Thorstein, or Hjolf Hjolf’s son. And, as a lady of her time and culture, she was quite content with her lot in life. You see, many modern stories would have you believe that every princess with a brain would have been a modern princess, bucking at social norms and demanding equality and the like. But this is a historically accurate fairy tale which seeks to respect the cultural situatedness of our heroine. She, like many other noble ladies of her day, thought her life was quite grand, not having to slop about with manual labor like a commoner. Now, as it sometimes happened in those days, her father was a warlike man who wanted more than he had. Greed, unlike bucking social norms, was as common in those days as it is today. And so her father Ulf lived up to his namesake, and tried to swallow the territories around him in giant gulps. But in doing so he earned the wrath of the war bands to his north. They were warriors who, learning from the Romans centuries before, fought easily on mounted horse instead of simply on foot. Now, until the invention of the pikestaff, it is well known that a mounted soldier would be worth ten men on foot. So it is that Ulf’s people found themselves at a great disadvantage when they, simple walking folk who cleaved their way through the lands to the south and west of them, came up against the mounted soldiers of the north. Now, some of these mounted soldiers were also noblemen of their clan. Noble mounted men are called Knights. The term Knight, really just means servant, but the idea of a mounted nobleman riding in service to the government, goes back to the old Roman days and a class of people called the Equestrians. So, for all intents and purposes, these men were knights. Again…trust me. 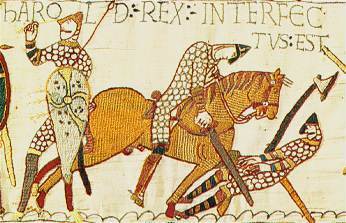 Now, Ulf’s warriors, though brave, loyal, and stalwart, were no match for these northern men and their galloping steeds. And soon Aesileif, our lovely, happy with the status quo, princess, was an orphan. The castle where she lived, which was really something like a hill fort, all staked round with wooden barricades and stockades, was soon to be overrun. And Aesileif was rightly afraid, for in those days (and sadly in these days) warlike men are not always the most courteous to the women of a conquered people. The gates were shut, and the doors closed fast. But there were few of her father’s men still able to hold sword and shield in that hill fort that day. Now, Aesileif was a Christian woman, as many of those warring Germanic peoples were in those days. She held her virtue in high regard, and wanted no knight to endanger it without first entering into the bonds of holy matrimony with him. And so, as the northern horsemen rode around the fort, calling out to the young princess with words that perhaps are among the most rude things that can be said whilst riding around someone’s home on a horse, she prayed fervently to the Lord that she might be delivered from her distress. And, as is always the case, the Lord heard the prayer. And, as is sometimes the case, He, in his wisdom, chose to answer it even as she had asked. And so the Lord called forth his servant, a great fire dragon from the eastern mountains. Up it rose from its dark and vast chambers in the roots of the hills, and spread its mighty red wings across the sky. A terrible cry went up from the marauding men: “Wyrm! Wyrm!” And some of those brave horsemen fled immediately. But those who were very brave crashed their swords against their shields and prepared for terrible combat with the fire drake. And so she did even as he commanded. And the dragon flew off to the mixed relief and disappointment of the northmen and set himself down atop the mountain where his own caves were hidden. There a cave was prepared where the Princess might live with her ladies, and treat with messengers from more noble men who might wish to win her hand. Again, being a lady of her day, she did not deign to choose her own husband, but left the decision to the great fire drake who was wise and full of the insight of his master. And he, being a kindly dragon, and not enculturated into a wholly patristic society (for dragons are a very egalitarian people historically), sought her counsel on who she might like best to marry. And so a goodly match was made after a year of suitors coming to the mountain. Her new husband was not a greedy man, nor a cruel man, but he was also a product of his time and place, and thought of Princess…or rather Queen…Aesileif as something of a subordinate to him. She thought very little of this, except on the nights when she prayed and gave thanks for her deliverer, the great dragon of the east, who had treated her with great courtesy and fairness. Perhaps then, in a small place in her heart, she did perhaps wish that things were a little different. But not so much as to be unnatural for a woman of her status and day.